Shohreh Aghdashloo made her American film debut in 1989 in a starring role in Guests of Hotel Astoria. Her television debut came in1990 in a guest role in the two-hour episode of the NBC television series Matlock, titled "Nowhere to Turn: A Matlock Mystery Movie". In the years that followed, Aghdashloo appeared on screen sporadically, including in the critically acclaimed Surviving Paradise. Having been shown at major International Film Festivals, Surviving Paradise went on to become one of the most well received Iranian films in the United States. In 2001, Aghdashloo was cast opposite Ben Kingsley and Jennifer Connelly in director Vadim Perelman's House of Sand and Fog (2003) for which she was nominated for the Academy Award for Best Supporting Actress. Following this exposure, Aghdashloo had a prominent recurring role on Season 4 of the Fox television series 24, playing Dina Araz, a terrorist undercover in Los Angeles as a well-to-do housewife and mother. In the period that followed, Aghdashloo made guest appearances on several well-known television series, such as Will & Grace, ER, and Grey's Anatomy. She also played supporting roles in films such as X-Men: The Last Stand as Dr. Kavita Rao, The Lake House, The Nativity Story as Elizabeth, and The Sisterhood of the Traveling Pants 2. 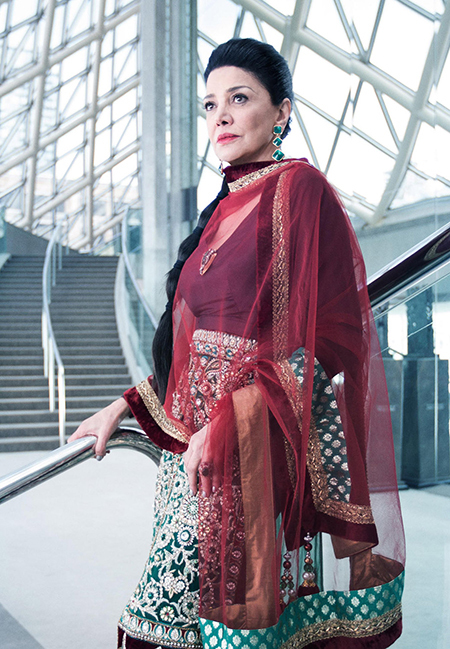 In 2008, Aghdashloo served as an official festival judge at the second annual Noor Iranian Film Festival in Los Angeles, while she also played the lead character of Zahra Khanum in the film The Stoning of Soraya M., marking her first leading role in a feature-length American film. In the same year, she also portrayed Sajida Talfah in the HBO original miniseries House of Saddam for which she received the Primetime Emmy Award for Outstanding Supporting Actress in a Limited Series or Movie. Agdashloo continues to act in films, such as The Odd Life of Timothy Green, Septembers of Shiraz, and Star Trek Beyond; and on television, guest starring on series such as House, M.D., The Simpsons, Grimm, Law & Order: Special Victims Unit, and NCIS. She also voiced characters for the video games Mass Effect 2, Mass Effect 3, Destiny, and Destiny 2.